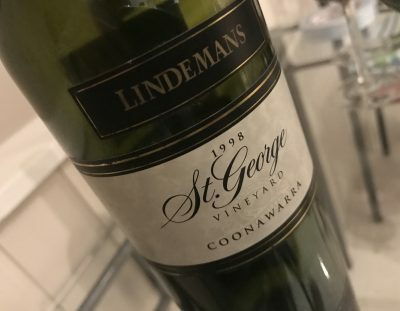 I imagine there’s still loads of ’98 reds sitting out there dormant in wine cellar land; everyone convinced that the wines will live forever. This St George definitely could. That said, it’s a quiet wine in many ways – the antithesis of many ’98 reds. This bottle, too, looked still in a transition phase. Carrying it’s Coonawarra eucalpyt and cedar card proudly, it’s only medium bodied and very much shaped by tannins. The fruit is still there, subtly, but it’s being consumed by said tannins. The overall effect is a wine more like the 80s St George style, except without the greenness. A lamb wine, and sneakily drinkable at that, with many many years ahead of it. Best drinking: 2017-2030. 17.7/20, 92/100. 13%. Would I buy it? At a fair auction price this would be a solid purchase, if not quite exciting.